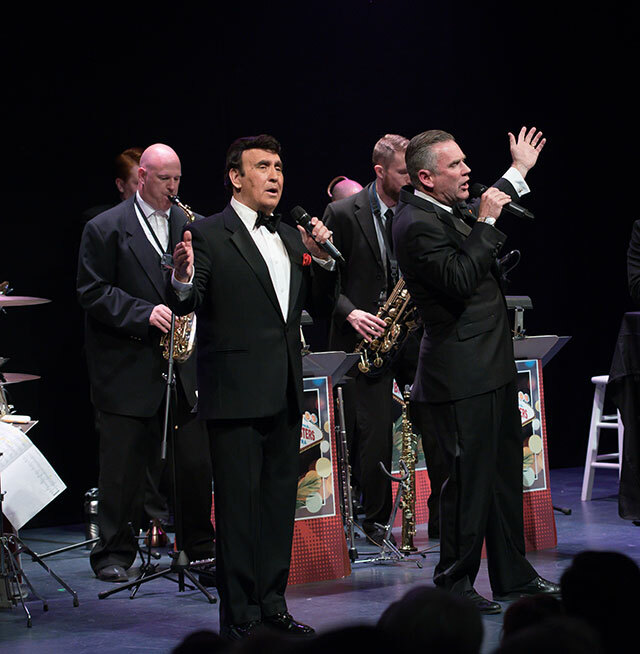 Following a fourth straight season of increased ticket sales, the lineup for the 2016-2017 Illinois Central College Guest Artists Series opens in August with a tribute to the smooth sounds and coolness of the Rat Pack. Frank and Dean Together Again, a tribute to Frank Sinatra and Dean Martin complete with a backing four-piece ensemble, opens the 2016-2017 ICC Guest Artists Series on August 12. The show kicks off the season performances by nationally- and internationally-touring professional artists. All performances take place in the ICC Performing Arts Center on the East Peoria Campus. The second show of the season features an acoustic performance of songs of one of the most successful recording duos in pop music history. Scarborough Fair: A Simon & Garfunkel Experience features an evening of music with stories and trivia sprinkled in, all performed by brothers Jeb and Jock Guthrie on October 21. December brings a performance based on a beloved pop musician of the 1970s when A John Denver Christmas featuring Ted Vigil takes the stage December 16. Vigil’s resemblance to the late musician so amazing that Steve Wiesberg, John Denver’s lead guitar player from the 1970s, said after performing with Vigil: “Apparently the audience thinks they all look and sound like John; I don’t see it. I see it with Ted. A very strong physical resemblance…uncanny!” This holiday-themed show features Vigil along with a backing band. On March 10, internet sensation Andy Gross brings The Mind Boggling Variety Show featuring comedy, magic and ventriloquism. Known as “The Split Man” after an online video he posted of himself—a video in which he surprises people by walking while appearing to be cut in half–went viral, Gross’ show is great for kids while offering a level of sophistication adults will enjoy. The final show of the season takes place on May 19 and harkens back to the days of soda fountains and jukeboxes when Johnny Rogers presents Buddy & Beyond: The History of Rock and Roll. The show features a backing band with vocalists performing great rock and roll classics and includes Rogers’ uncanny portrayal of the legendary Buddy Holly. Season ticket packages and tickets to individual events are currently on sale. Season tickets can be purchased either by phone at (309) 694-5136 or in person at the ICC Performing Arts Center Box Office; tickets to individual shows can be purchased by phone, in person or online at ArtsAtICC.com. Full season ticket packages cost for $100 and include tickets to all five shows. Those purchasing the full season ticket package get to choose their own seats (based on availability) and retain those same seats for all shows in the series. Full season ticketholders also receive two complimentary tickets for each season ticket package purchased to ICC Theatre Program productions. Pick 4 Flex Packs also are available for $85 and include four tickets that can be split or used in any combination for Guest Artists Series events. Seating for Pick 4 Flex Pack purchasers is assigned by the box office based on the best available seating for each performance. Buddy & Beyond: The History of Rock and Roll featuring Johnny Rogers, May 19: general public $25, students $15. Once again this year, the Arts at ICC will offer a holiday-themed performance the Saturday following Thanksgiving by Chicago’s very own The Second City. The Second City’s Dysfunctional Holiday Revue takes place on November 26 but is not part of the Guest Artists Series. Tickets cost $30 for all ages, but those who purchase full season ticket packages for the Guest Artists Series can add a ticket to the Second City show for the discounted price of $20. The Dysfunctional Holiday Revue includes music, sketch comedy and the trademark improvisational comedy for which The Second City is known. This show is rated R for adult themes. All performances begin at 7:30 pm and take place in the ICC Performing Arts Center on the East Peoria Campus. The Guest Artists Series is presented by the Arts at ICC, which has a rich history of enhancing the arts community and expanding education beyond the classroom. Arts at ICC presents more than 500 exhibits, performances, lectures, rehearsals, meetings, master classes, clinics, seminars, receptions, orientations, forums, auditions and tournaments annually. For information about tickets or the individual performances, visit ArtsAtICC.com or call the box office at (309) 694-5136.